« Are You Unknowingly Violating the Fair Labor Standards Act? Fair Labor Standards Act audits are on the rise, according to Secretary of Labor Hilda Solis. Most of these audits will reveal that common everyday business practices often result in unpaid “work” hours that 70% of employers have no idea are unlawful, but do in fact, violate the Fair Labor Standards Act (FLSA). Below are 12 tips that you should implement in your business to ensure that you are in compliance, while this is not an all inclusive list these items will help you move in the right direction. Require your hourly employees to accurately record their work hours and to submit a timesheet that they certify as being accurate to a manager or supervisor; in a timely manner. Make it mandatory for supervisors and/or managers to review timesheets submitted by hourly employees promptly to identify any inaccuracies. Forbid your hourly employees from showing up at their desk before their normal start time. Forbid employees from working while they are on a lunch (or other) break. Get tough with employees who are constantly punching in our out improperly or incorrectly. If you pay Suzy for a normal 9-5 workday and you receive several business related emails from her between 7-9 am or 6-8 pm; pay her! Require supervisors and/or managers to report any and ALL suspected “off-the-clock” work so employees are paid for that time. Implement steps to prevent off-the-clock work from happening. Make sure that supervisors/managers rarely do “hourly” type work – if they occasionally need to, make sure that it’s not all morning or all afternoon. ALL nonexempt (hourly) managers or supervisors need to have at least two full-time employees directly under their supervision. Give exempt (salaried) managers the ability to hire and discipline employees. Allow exempt managers the authority to make decisions that affect the company as a whole, to a certain level. If you are involved in an audit, make sure that you have an absolutely accurate record of hours worked by all employees. An automated time and attendance system is an easy-to-use and easy-to-implement method for staying in compliance with many wage-hour regulations. Some of these systems are actually programmed to alert you to issues that are potentially costly to your company. Believe it or not, some of these programs can actually prevent early punch-ins of more than a few minutes. 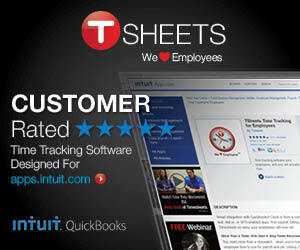 For Time Tracking programs that interface with QuickBooks, visit the Intuit Marketplace. I love this post. You always share great information. Great for retweeting, which I did.